At the time of it's original broadcast, the internet was flooded with ways that Agents could improve. Personally, I found it a little annoying because; 1) The show had only begun and 2) These were obviously people who hadn't given the show a chance. I remember thinking when I originally watched the show how exciting it was and much fun it seemed to be having in ironing out the kinks that I will admit it had. But the previous couple of episodes had greatly improved and F.Z.Z.T continued that tradition. F.Z.Z.T was a pretty focused and emotional episode finally given Fitz and Simmons a moment to shine and push their relationship to the fore. It was obvious from their teammates reactions here that had begun to mean a lot to each other, it was just a shame that we hadn't seen that before. It also did a good job of breaking away from the wider Marvel umbrella and pushed the show into the direction of making it its own programme that wasn't going to be held down by what had been seen in The Avengers. And, the inclusion of an alien Chitauri helmet, the aliens from The Avengers gave us a much more interesting storyline that it might have first seemed. The episode began with a number of firemen first responders dying having contracted an alien virus from their contact with the alien helmet when they tried to polish their trophy. What was really interesting here was that the illness was treated as if there was no hope and in a bleak twist, we see Coulson helping someone come to terms with that before walking away and letting the man die. But it was when Simmons contracted the virus that it made the episode one of the standouts of the first season and the episode instantly became about the possibility of the team losing one of their own. Though, as I stated above, it was weird to see all these characters being upset at the prospect of losing Simmons simply because none of them had spent a lot of time with her. 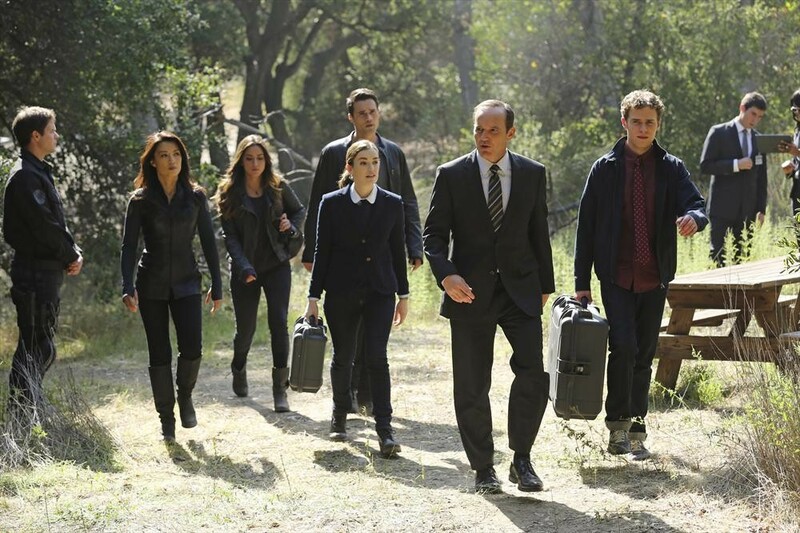 But the whole episode was done particularly well and actress Elizabeth Henstridge was really good in her scenes were Simmons comes to terms with the fact that she is going to die. I was particularly surprised to find I was getting a little upset at her asking Coulson to tell her parents how she died and who to tell first given that so little time had been given to her that I didn't particularly feel any connection to her. However, it is this episode that you can see the difference in terms of the budget between a television show and a major motion picture with the scene of Ward skydiving to save Simmons looking a little hooky. It is a little jarring that you can clearly see that the actor is by a green screen but it is heart warming to see that the team would do anything for each other despite having spent no time together. And the sequence with Fitz trying to put on the parachute was sweet! This episode also continued that darker tone that had been introduced a couple of episodes ago, with the humour being particularly scaled back. I think it is a good thing that the writers are scaling back the humour as it was something that did affect the early episodes. It was a joy to find that this episode was serious and there was a feeling of tension in every shot. We also get some further mysteries on the Coulson front with his physical showing up some anomalies. He even tries to bring up the fact he has felt off before May but she knocks it aside with a comment about how that is how anyone would feel after what he had been through. Hopefully that story arc is resolved soon as it does seem that it doesn't need that long to be explored. This episode took some important steps in the Fitz/Simmons area that the show needed, giving them the characterisation that they lacked and making them more likable to the audience. I now feel the show is ready to go off in bold new directions!